Vaazhai Thandu or plaintain stem has numerous benefits.We use it in kootu, Mor kootu, Pachadi and curry. The only difficulty people find in using this is the removal of the fibres.To use a plaintain stem, first remove the outer thick fibrous part peels off easily. Next you get to the shiny layer which is not so loosely attached. This you need to cut vertically all over the surface. Next cut into thin round discs the stem which is remaining. Now cut each disc into small cubes and put it in a vessel having diluted buttermilk. This prevents the discolouration of the stem. Now take a wooden skewer, insert it into the vessel with the vegetable and make a churning like motion alternating in clockwise and anticlockwise direction. When you take it out, you see that the fibre is collected to the skewer. Take that out and repeat till all the fibre is removed.Drain the liquid completely and you are ready to cook the vegetable now. Heat 1 tsp oil in a pan. 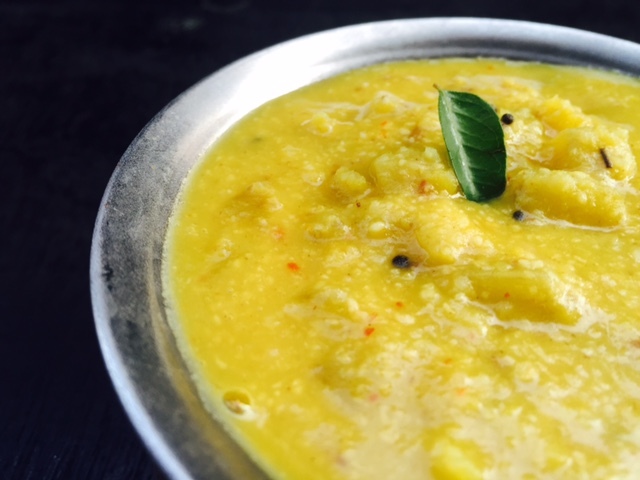 Add the urad dal, red chillies, cumin seeds and fry till the dal becomes brownish. Switch off the fire. Let it cool. Now grind it along with the coconut into a smooth paste. Keep aside. Add the turmeric powder to the cut vegetable, mix well. Microwave it for 5 minutes , keeping it close. Let it cool. Add oil to a pan, once heated add mustard seeds, asafoetida and when it splutters, add the cooked vegetables, cooked dhal, ground paste, salt and some water and let it boil for few minutes. 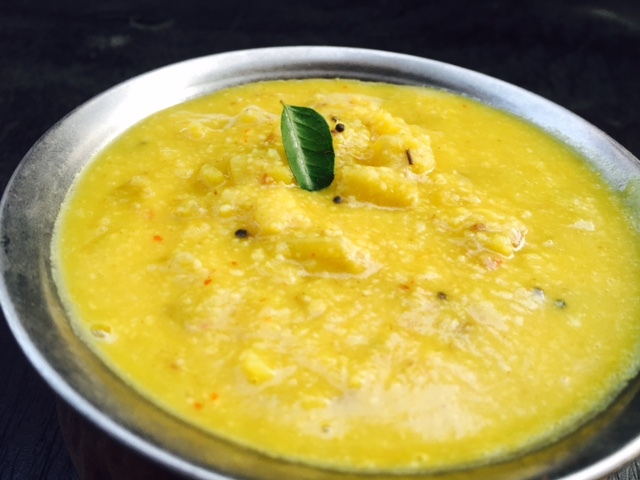 Switch off the fire and serve hot with thogayal and rice.